There are many situations where carrying a firearm can mean the difference between life and death. You’ll rely heavily on what you’ve trained yourself to do, so it’s critical that you practice gun safety training the right way in order to correct any mistakes before they become a habit. While there’s more than one “right way” when it comes to using a firearm for self-defense, there are certainly plenty of wrong ways. Jordan McDowell is a writer and second amendment rights advocate. As a proud advocate for responsible gun rights nationwide, he writes about recreational hunting as well as the latest developments in state and national legislation. Mistakes you make in firearms training can have serious consequences. These are some of the mistakes people often make when starting out. Your training needs to be focused on the skills you need. Start by identifying your goals and find the instruction to match. You may have taken a course on sharpshooting, but don’t expect it to properly prepare you for self-defense. The guns you use and the circumstances you use them in are completely different. Take courses that prepare you to use the gun or guns you plan on carrying. Then factor in the actual circumstances you may need to use them for self-defense in the real world. Specialized courses may teach you how to create distance with an attacker or react to physical contact. As you research classes, look for the proper student to teacher ratio for your needs. Many courses open enrollment to 20 or even 30 students per instructor. As your life may be dependent on the firearms training you receive, it’s critical to have the one-on-one time you need. If the class will have more than a handful of students, make sure assistant instructors will be present too. Bigger is not necessarily better. Especially if you plan on concealed carrying. Accuracy is the most important factor when choosing a handgun. Try before you buy to find the right firearm for your style. The last thing you want is to be struggling with your weapon while fighting off an attacker. Carrying a firearm – regardless of why – is a tremendous responsibility. Abusing that responsibility can have life-altering consequences. Even drawing your weapon in a circumstance that doesn’t warrant it can lead to legal liability. Avoid conflict when possible and never escalate situations that may lead to violence. This frame of mind can help keep you out of jail, or other legal trouble. While you don’t want to be an action star with your weapon, part of self-defense is being aware of your situation. Know your surroundings and look for clues about how an attacker may exploit a situation. This doesn’t mean you have to be paranoid at all times. But having a healthy awareness can help you maintain readiness. In a deadly encounter when adrenaline is pumping, the critical steps of readying your weapon should come to you instinctively. Regular practice can commit these skills to muscle memory so you can draw, fire, and reload your weapon all in a fluid motion without having to think about it. If you plan to carry for self-defense, make sure you know what laws and ordinances are in effect in any area you plan to carry. Do your research and follow up with training with courses offered by local law enforcement to ensure you’re always within the law. Even if you feel like you are knowledgeable, license requirements may change. There could also be new equipment or techniques developed for carrying that can help you be more effective at using your gun for self-defense. Making the effort to attend at least one training course per year can not only help with your firearm practice, but also keep you up to date on best practices for carrying and using your firearm. Your firearm isn’t the only piece of everyday carry gear you’ll have. Firearms have a number of accessories that must be well taken care of to ensure your self-defense weapon is working & accessible. The most important of these accessories is your gun’s holster. Many people starting out don’t treat their holster properly. For instance, one of the common mistakes is over-softening a holster with oils to break it in. 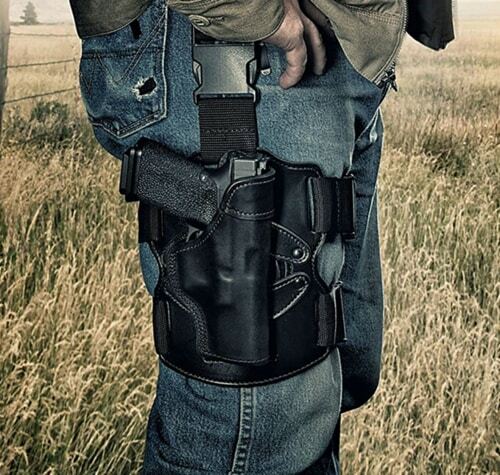 An over-softened holster will not keep its shape or provide a proper grip on your gun. The type of holster you are using with your firearm will determine the best way to care for it. Regardless if you have leather, nylon, kydex, or something else, if your holster is in good shape it will help keep your firearm in good shape too. A situation where you have to protect yourself from an attack is not a position anyone but the bravest among us wants to be in. But preparing yourself with the right gun safety training classes can go a long way. That means taking the right training courses, purchasing the best firearm for your needs and being in the right frame of mind. If you’re ever in doubt, reach out to an instructor or other experts where you practice. Checking for mistakes is a big part of ensuring that you are most effective with your firearm. Interested in building your own firearm? Here's an article about the Polymer 80 Pistol that may interest you.